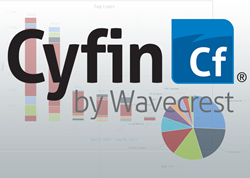 Wavecrest Computing is excited to announce the release of a new enhancement to Cyfin Employee Web-use Reporting and Analytics Suite--custom charts. Cyfin’s new custom charts feature makes it easier for our customers to view and analyze employees’ Web-use behavior in the specific way their unique business requires. Wavecrest, a global leader in employee Web-use management and security solutions, today announced a new Cyfin enhancement--customizable charts. Bringing more personalization to Cyfin’s comprehensive employee Web-use reporting and analytics tools, this enhancement provides the ability to view, save, and print customizable charts, such as time series, bar, and pie charts. These intuitive charts deliver features such as subgrouping and built-in drill down to give customers the highly useful, interactive visibility required to manage and secure employee Web-use. Cyfin provides accurate, actionable, manager-ready reports along with easy-to-interpret, intuitive charts, user-friendly self-service manager access, ad hoc reporting for on-demand reports, automatic log file analysis and detection, and a built-in syslog server, and more. Cyfin integrates effortlessly with Palo Alto, Check Point, SonicWall, WatchGuard, and 100-plus more devices and is available in software, forensic, and virtual appliance deployments. For more information, visit https://www.wavecrest.net. Wavecrest has over 20 years of proven history of providing reliable, accurate Web-use management and Advanced Log File Analyzer products across various industries. Managed Service Providers, IT specialists, HR professionals, Forensics Investigators, and business managers trust Wavecrest's Cyfin and CyBlock products to manage the human factor in business Internet usage -- managing cloud services, reducing liability risks, improving productivity, saving bandwidth, and controlling costs. Trusted by large government and commercial organizations such as US-CERT Homeland Security, U.S. Department of Justice, USPS Office of Inspector General, National Grid, Johns Hopkins, and a growing list of global enterprises and government agencies. We are a proud long-term GSA contract holder. For more information on the company, products, and partners, visit https://www.wavecrest.net.